Want to give a great gift to your girlfriend or wife? From now until April 3, 2011, save an extra 30% off your purchase at Coach Factory Store with this printable coupon. This offer applies on already reduced prices. Click here to print the coach factory 30% off coupon. Check out your nearest Sears Estee Lauder cosmetic counter, from now until April 13, 2011, and receive a free gift. With any Estee Lauder purchase of $34 or more, you can choose one of two gifts worth over $95. Some conditions apply. Click here to buy Sears online now or for more information about the deal. This is a limited 1-day only sale that will expire tonight at midnight (Thursday, March 31, 2011). Click here to buy now or for more information about the deal. Quantities are limited so don’t miss out! Buy up to 1 voucher for yourself and unlimited as gifts. Limit 1 voucher for personal use. Valid for dine-in or take-out. Limit 1 voucher per table or party of 3, or 2 vouchers per table or party of 4 people or more. Valid for $40 worth of food and non-alcoholic beverages. Valid at the following locations: 66 St-Viateur Street West, Montreal (514.903.7770) or 2153 Mackay Street, Montreal (514.903.4744). Not valid for tax and gratuities. Not valid with other offers. No cash back or credit. Cannot be redeemed before Wednesday, April 6, 2011. 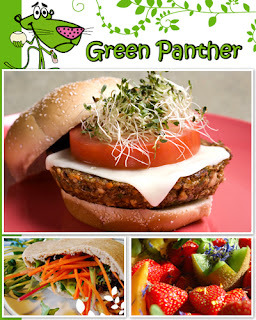 The Green Panther is the hunter-gatherer hot spot for urban junglists on the prowl for organic eats. By creating local alternatives through the use of organic produce (local when available) and recycled materials (not recycled food) they endeavour to raise awareness about healthy eating and the importance of living a healthy lifestyle. Delicious veggie burgers, tofu steak, fresh smoothies and fruit juice are all on the menu to inspire curious fresh food fanatics, vegan champions and transitioning vegetarians weaning themselves from the meat market for good. There is nothing better than consuming food that is guilty conscience-free, especially when it is as well prepared as it is at The Green Panther. Today’s the day to get down with the organic freight train of health. All aboard. The Green Panther has been given an average rating of 4.5 stars on Google Maps, 4.5 stars on HappyCow.net and 94% of UrbanSpoon.com reviewers like it. KidsBowlFree.com: Kids Get 2 Games Free All Summer! If you haven’t heard of the Kids Bowl Free program, it’s an awesome nationwide program which allows kids to bowl for free each and every day in the summer time! Starting May 1st and ending September 15. Kids will receive 2 free games of bowling each and every day during the summer. There is no cost to participate in the program. You will have to register an account on the Kids Bowl Free site. (link below). Once the program starts they will be sending out coupons to those who have registered. Simply print these out and present them to take advantage of the program. If you are interested in more information, their website has a FAQ which will hopefully answer all of your questions. Here is a video about the program itself. Click here for more information about the Kids Bowl Free program and to register at your nearest bowling alley. 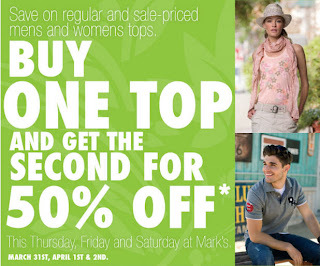 Between March 31 to April 2, 2011, visit your nearest Mark’s Work Wearhouse store to check out their buy one, get the second 50% off offer. This offer applies to all men’s and women’s regular and sale priced tops. Some conditions apply. Click here to shop Mark’s Work Wearhouse online now or for more information about the deal. Looking to order some clothing from La Senza? Well they are having a $3 shipping event until April 1st! Not a bad deal if you are considering ordering online sometime soon. Abercrombie & Fitch is having a sale where you can take an additional 30% off the entire store. This sale is available in-stores and online. If ordering online, enter the promo code “13018” to get the discount. The discount should be applied automatically in-stores. This is a limited 1-day only sale that will expire tonight at midnight (Wednesday, March 30, 2011). Click here to buy now or for more information about the deal. Quantities are limited so don’t miss out! Buy up to 5 vouchers for yourself and unlimited as gifts. Limit 5 vouchers for personal use. Package includes a 90 minute professional in-studio or on-location photo shoot within Metro Montreal, plus three 8×10 prints, images on DVD and online access to private gallery with downloadable high resolution photos. An unlimited number of shots are taken during the 90 minute session and all shots are uploaded to the on-line gallery and DVD. By appointment only, please call 514.835.5596 for bookings. 48 hour cancellation policy or voucher is voided. Limit 1 voucher per photo shoot for up to 4 people, or 2 vouchers for 5-10 people. Not valid for taxes. No cash back or credit. Not valid with other offers. Cannot be redeemed before Thursday, March 31, 2011. 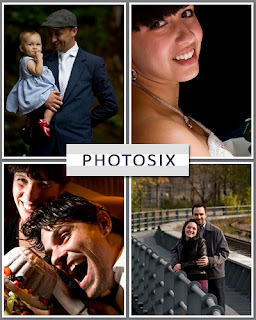 Operated by photojournalist and documentary photographer extraordinaire Allen McEachern, PhotoSix has been established as the go-to company when it comes to freeze framing your life and loved ones. They are proud to open the doors to their studio for today’s deal, which offers a 90-minute shoot (in-studio or at a location of your choice) with all the trimmings. As well as professional prints, a DVD of your images and online access to hi-res photos – a deal to end all deals. Don’t miss out on the excitement and fun of getting your pictures taken by a pro; your moments may be ephemeral, but reliving them doesn’t have to be. Book your appointment, today. Allen McEachern of Photo Six Photography was the recipient of the prestigious Bride’s Choice Awards 2011, and is an international award-winning photographer.